The Pinehurst, Southern Pines, Aberdeen Area has a storied legacy of golf unlike any other place in the country. In 2014 we made golf history again when the U.S. Open and U.S. Women’s Open Championships were played back-to-back on the same golf course for the first time ever. Here you’ll find North Carolina’s best golf courses, world-class dining and shopping, outdoor adventures, equestrian facilities, and more. But it’s not just an ideal family vacation destination. With a wide variety of hotels, resort-style accommodations and meeting spaces, it’s also an ideal location for corporate events and group golf outings. Looking for the perfect place for your meeting, conference or retreat? The Pinehurst, Southern Pines, Aberdeen area offers genuine Southern hospitality and affordable meeting space for all budgets. For over a century, people from all walks of life have found their way to the Sandhills to relax, play golf and enjoy the temperate climate. 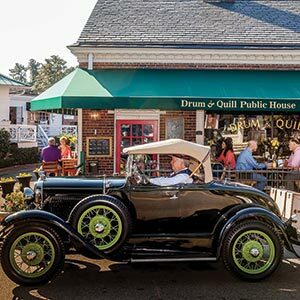 The Pinehurst, Southern Pines, Aberdeen area may be known as the Home of American Golf, but it’s home to so much more than that. With 40 world-class courses within a 15-mile radius, it's no surprise that year after year, area courses receive high praise and top rankings throughout the golf industry. When you visit The Home of American Golf you can expect outstanding golf, award-winning dining, and southern style hospitality.